iwantmyname | How do I change my password? If you are trying to reset your password and you are not receiving the password reset emails (and they're not caught in your spam folder), please let us know and we can assist. If you are able to login in to your iwantmyname account, do so, then in the main dashboard menu, click on Account, then Login & Security. 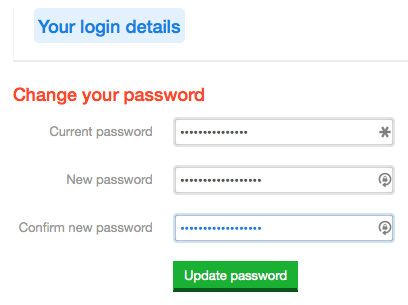 Type in your current password, then the new password you want to use. Click the Update password button to save the settings. Note: On this page you can also update your account's email address and set up two-step verification for your account to provide additional security. If you have any questions or need additional help, just let us know.